To capture gains from advanced systems like Oracle Exadata sooner than later, businesses seek solutions to migrate with minimized downtime and risk. Oracle GoldenGate offers real-time, heterogeneous database replication capabilities that eliminate downtime from upgrade, migration, and consolidation projects. 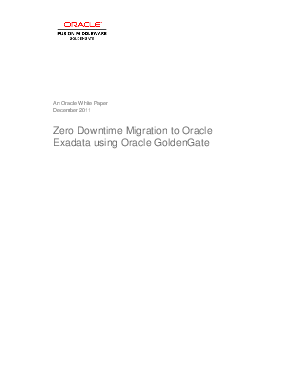 This paper reviews Oracle GoldenGate's capabilities and how it can be used to achieve zero downtime migration and consolidation to Oracle Exadata.